Ellie thought she knew what she wanted in a guy: someone dependable, and someone she could bring home to her parents. In other words, a good guy to complete her happily-ever-after fairy tale. 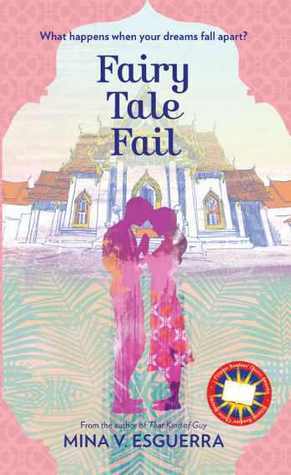 But when her good guy boyfriend all of a sudden dumps her in the place she least expected -- saying that she is "a failure at relationships" -- Ellie feels she has to fight harder to make her fairy tale come true. But when Lucas, whom Ellie secretly calls Rock Star, enters her life and starts challenging everything she believes in, she has to face the truth about her goals and dreams. Will Ellie find the fairy tale she's always dreamed of? And more importantly, who will fill the swashbuckling shoes of Prince Charming to give her story the happy ending she so deserves? This is the first book I’ve read from Summit Media publisher and it is created by one of the awesome Filipino authors of this generation. From the title of it I already knew that this is some kind of a love story that fails but then the reason why and what comes after the break up intrigues me. When it comes to the book cover, the one I saw first was the e-book form and it is simple yet a good one but when I saw the printed version of the book it is catchier and personally I like it more. When it comes to the story, I enjoyed reading it. Very straight forward and it is an easy read. Somehow I can relate to the story for I have been through this and still moving on. I know how hard it is to move on to something that you think is perfect but in the end it will end up in to a nightmare, enough of that. I think the book is a perfect example for some ladies out there that is having a hard time to move on and they’re thinking of second chances, well it is not impossible but then people have to look forward into something big – I’ve learned something from this book. The character’s roles are awesome and the twist of the story is a good one. I wasn’t expecting that this guy would end up to this girl for they are not close or whatever. I also like how the character handled the pain she had experienced. She portrays the role of being a fighter – a woman who doesn’t give up no matter how big or small the problem is. Luckily the book ends well but in a different way yet it is fun and a good one. Ellie is a happy-go-lucky woman who always wants to plan ahead. She thinks of her future and her likes and dislikes and connects it to her partner in life so that she can create a perfect fairy tale (just like me). Don on the other hand is the opposite. He is a practical man who thinks of his position at work and he wants everything to be organized. For the counter part Lucas is the kind of man who is also like Ellie. The story of the book revolves around the three of them and it is worth to read. Lucas is some kind of an extra but he plays the big role in the book. This is a short yet heart-warming book. I pretty much love it. I hope there is a separate story between Ellie and her new love.